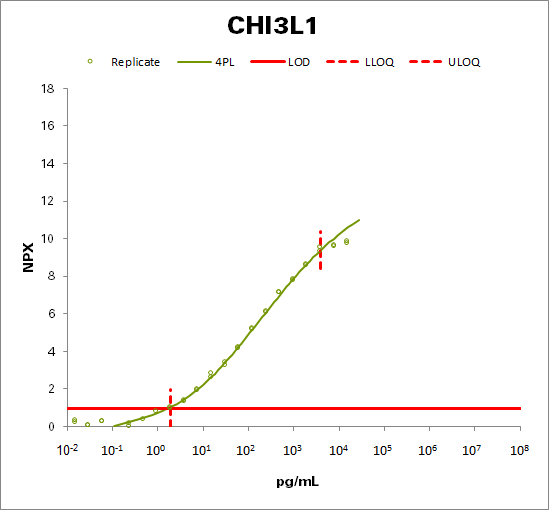 CHI3LI (also known as YKL-40) is a secreted glycoprotein related to the chitinases, but lacking chitin hydrolysis activity. It is able to promote angiogenesis through VEGF-dependent and independent pathways. It is also thought to be involved in tissue remodeling and in cellular responses to changes in their environment.The protein plays a role in T-helper cell type 2 inflammatory response and IL-13-induced inflammation, regulating inflammatory cell apoptosis and M2 macrophage differentiation amongst other functions.